Frey, R.J. (2015). Lyme disease. In Gale (Ed. ), The Gale encyclopedia of senior health: a guide for seniors and their caregivers. (2nd ed.). [Online]. Farmington: Gale. Available from: https://search.credoreference.com/content/topic/lyme_disease [Accessed 26 April 2019]. Frey, Rebecca J. "Lyme Disease." The Gale Encyclopedia of Senior Health, edited by Gale, 2nd edition, 2015. Credo Reference, https://search.credoreference.com/content/topic/lyme_disease. Accessed 26 Apr. 2019. Lyme disease is an infection transmitted by the bite of ticks carrying the spiral-shaped bacterium Borrelia burgdorferi. The disease was named for Lyme, Connecticut, the town where it was first diagnosed in 1975 after a puzzling outbreak of arthritis. The organism was named for its discoverer, Willy Burgdorfer. The effects of this disease can be long term and disabling unless it is recognized and treated properly with antibiotics. Lyme disease, which is also called Lyme borreliosis, is a vector-borne disease. This term means that it is delivered from one host to another. It is also classified as a zoonosis, which means that it is a disease of animals that can be transmitted to humans under natural conditions. In this case, a tick bearing the B. burgdorferi organism literally inserts it into a host's bloodstream when it bites the host to feed on its blood. It is important to note that neither B. burgdorferi nor Lyme disease can be transmitted directly from one person to another, or from pets to humans. Controversy clouds the true incidence of Lyme disease because no test is definitively diagnostic for the disease, and many of its symptoms mimic those of so many other diseases. Cases of Lyme disease have been reported in 49 of the 50 states; however, 95% of the more than 25,000 confirmed cases reported to the Centers for Disease Control and Prevention (CDC) in 2013 were from only 14 states (Connecticut, Delaware, Maine, Maryland, Massachusetts, Minnesota, New Hampshire, New Jersey, New York, Pennsylvania, Rhode Island, Vermont, Virginia, and Wisconsin). The disease is also found in Scandinavia, continental Europe, the countries of the former Soviet Union, Japan, and China; in addition, it is possible that it has spread to Australia. In the United States, Lyme disease accounts for more than 90% of all reported vector-borne illnesses. It is a significant public health problem and continues to be diagnosed in increasing numbers. The CDC attributes this increase to the growing size of the deer herd and the geographical spread of infected ticks rather than to improved diagnosis. In addition, some epidemiologists believe that the actual incidence of Lyme disease in the United States may be five to ten times greater than that reported by the CDC. The reasons for this difference include the narrowness of the CDC's case definition as well as frequent misdiagnoses of the disease. The risk for acquiring Lyme disease varies, depending on what stage in its life cycle a tick has reached. A tick passes through three stages of development—larva, nymph, and adult—each of which is dependent on a live host for food. In the United States, B. burgdorferi is borne by ticks of several species in the genus Ixodes, which usually feed on the white-footed mouse and deer (and are often called deer ticks). In the summer, the larval ticks hatch from eggs laid in the ground and feed by attaching themselves to small animals and birds. At this stage they are not a problem for humans. It is the next stage—the nymph—that causes most cases of Lyme disease. Nymphs are very active from spring through early summer, at the height of outdoor activity for most people. Because they are still quite small (less than 2 millimeters), they are difficult to spot, giving them ample opportunity to transmit B. burgdorferi while feeding. Although far more adult ticks than nymphs carry B. burgdorferi, the adult ticks are much larger, more easily noticed, and more likely to be removed before the 24 hours or more of continuous feeding needed to transmit B. burgdorferi. Humans develop Lyme disease when bitten by ticks infected with the bacteria B. burgdorferi. Within days flulike symptoms develop, but over time symptoms become much more severe. Lyme disease is caused by B. burgdorferi. Once B. burgdorferi gains entry to the body through a tick bite, it can move through the bloodstream quickly. Only 12 hours after entering the bloodstream, B. burgdorferi can be found in cerebrospinal fluid (which means it can affect the nervous system). Treating Lyme disease early and thoroughly is important because Lyme disease can hide for long periods within the body in a clinically latent state. That ability explains why symptoms can recur in cycles and can flare up after months or years, even over decades. It is important to note, however, that not many people who are exposed to B. burgdorferi develops the disease. Lyme disease is usually described in terms of length of infection (time since the person was bitten by a tick infected with Lyme disease) and whether B. burgdorferi is localized or disseminated (spread through the body by fluids and cells carrying B. burgdorferi). Furthermore, when and how symptoms of Lyme disease appear can vary widely from patient to patient. People who experience recurrent bouts of symptoms over time are said to have chronic Lyme disease. The most recognizable indicator of Lyme disease is a rash around the site of the tick bite. Often, the tick exposure has not been recognized. The eruption might be warm or itch. 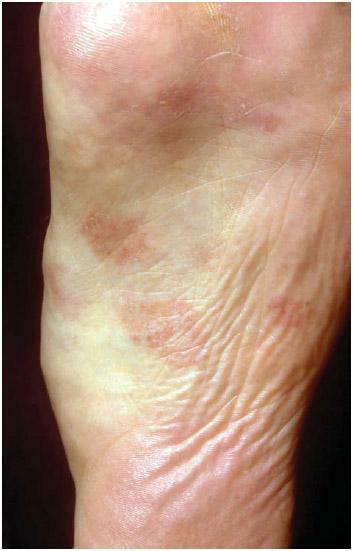 The rash—erythema migrans (EM)—generally develops within 3–30 days and usually begins as a round, red patch that expands outward. About 75% of patients with Lyme disease develop EM. Clearing may take place from the center out, leaving a bull's-eye effect; in some cases, the center gets redder instead of clearing. The rash may look like a bruise on people with dark skin. Of those who develop Lyme disease, about 50% notice flulike symptoms, including fatigue, headache, chills and fever, muscle and joint pain, and lymph node swelling. However, a rash at the site can also be an allergic reaction to the tick saliva rather than an indicator of Lyme disease, particularly if the rash appears in less than three days and disappears only days later. Neurologic problems, such as pain (unexplained and not triggered by an injury), Bell's palsy (facial paralysis, usually one-sided but may be on both sides), and a mimicking of the inflammation of brain membranes known as meningitis (fever, severe headache). A clear diagnosis of Lyme disease can be difficult, and relies on information the patient provides and the doctor's clinical judgment, particularly through elimination of other possible causes of the symptoms. Lyme disease may mimic other conditions, including chronic fatigue syndrome, multiple sclerosis, and other diseases with many symptoms involving multiple body systems. Differential diagnosis (distinguishing Lyme disease from other diseases) is based on clinical evaluation with laboratory tests used for clarification when necessary. A two-test approach is common to confirm the results. Because of the potential for misleading results (false-positive and false-negative), laboratory tests alone cannot establish the diagnosis. In February 1999 the U.S. Food and Drug Administration (FDA) approved a new blood test for Lyme disease called PreVue. The test, which searches for antigens (substances that stimulate the production of antibodies) produced by B. burgdorferi, gives results within one hour in the doctor's office. A positive result from the PreVue test is confirmed by a second blood test known as the Western blot, which must be done in a laboratory. The benefits of treating early must be weighed against the risks of overtreatment. The longer a patient is ill with Lyme disease before treatment, the longer the course of therapy must be, and the more aggressive the treatment. The development of opportunistic organisms may produce other symptoms. For example, after long-term antibiotic therapy, patients can become more susceptible to yeast infections. Treatment may also be associated with adverse drug reactions. For most patients, oral antibiotics (doxycycline or amoxicillin) are prescribed for 21 days. When symptoms indicate nervous system involvement or a severe episode of Lyme disease, intravenous antibiotic (ceftriaxone) may be given for 14–30 days. Some physicians consider intravenous ceftriaxone the best therapy for any late manifestation of disease, but treatments for late Lyme disease are still a matter of debate as of 2014. Corticosteroids (oral) may be prescribed if eye abnormalities occur, but they should not be used without first consulting an eye doctor. The doctor may have to adjust the treatment regimen or change medications based on the patient's response. Treatment can be difficult because B. burgdorferi comes in several strains (some may react to different antibiotics than others) and may even have the ability to switch forms during the course of infection. Also, B. burgdorferi can shut itself up in cell niches, allowing it to hide from antibiotics. Finally, antibiotics can kill B. burgdorferi only while it is active rather than dormant. Supportive therapies may minimize symptoms of Lyme disease or improve the immune response. These include vitamin and nutritional supplements, mostly for chronic fatigue and increased susceptibility to infection. For example, yogurt and Lactobacillus acidophilus preparations help fight yeast infections, which are common in people on long-term antibiotic therapy. In addition, botanical medicine and homeopathy can be considered to help bring the body's systems back to a state of health and well-being. A Western herb, spilanthes (Spilanthes spp. ), may be effective in treating diseases such as Lyme disease that are caused by spirochetes (spiral-shaped bacteria). A disease caused by protozoa of the genus Babesia characterized by a malaria-like fever, anemia, vomiting, muscle pain, and enlargement of the spleen. Babesiosis, like Lyme disease, is carried by a tick. A blockade of cells separating the circulating blood from elements of the central nervous system; it acts as a filter, preventing many substances from entering the central nervous system. Clear fluid found around the brain and spinal cord and in the ventricles of the brain. Scattered or distributed throughout the body. Lyme disease that has progressed beyond the stage of localized EM is said to be disseminated. Another name for Lyme disease. A spiral-shaped bacterium. The bacteria that cause Lyme disease and syphilis, for example, are spirochetes. Any disease of animals that can be transmitted to humans under natural conditions. Lyme disease and babesiosis are examples of zoonoses. If aggressive antibiotic therapy is given early, and the patient cooperates fully and sticks to the medication schedule, recovery should be complete. Only a small percentage of Lyme disease patients fail to respond or relapse (have recurring episodes). Most long-term effects of the disease result when diagnosis and treatment is delayed or missed. Coinfection with other infectious organisms spread by ticks in the same areas as B. burgdorferi (babesiosis and ehrlichiosis, for instance) may be responsible for treatment failures or more severe symptoms. Most fatalities reported with Lyme disease involved patients coinfected with babesiosis. A vaccine for Lyme disease known as LYMErix was available from 1998 to 2002, when it was removed from the U.S. market. The decision was influenced by reports that LYMErix may be responsible for neurologic complications in vaccinated patients. Researchers from Cornell–New York Hospital presented a paper at the annual meeting of the American Neurological Association in October 2002 that identified nine patients with neuropathies linked to vaccination with LYMErix. In April 2003, the National Institute of Allergy and Infectious Diseases (NIAID) awarded a federal grant to researchers at Yale University School of Medicine to develop a new vaccine against Lyme disease. As of late 2014, the best prevention strategy is through minimizing risk of exposure to ticks and using personal protection precautions. In highly tick-populated areas, each individual should be inspected at the end of the day for ticks. See a physician for any sort of rash or patchy discoloration that appears 3 to 30 days after a tick bite. See also Antibiotics; Bacterial infections; Fatigue; Joint integrity and function; Mobility issues; Neurologic examination; Osteoarthritis. “Lyme Disease.” In The Merck Manual of Diagnosis and Therapy, 19th ed., edited by Robert S. Porter; Justin L. Kaplan, p. 1268. Merck Sharp & Dohme Whitehouse Station NJ, 2011. Rosner, Bryan; Julie Byers; Michael Huckleberry. The Top 10 Lyme Disease Treatments: Defeat Lyme Disease with the Best of Conventional and Alternative Medicine. BioMed Pub. Group South Lake Tahoe CA, 2007. Gospodinova, M.; I. Christova. “Lyme Borreliosis in Patients over 60-Years-Old.” Problems of Infectious and Parasitic Diseases 38, no. 2 (2012): 20-24. Salzman, B. E.; J. Studdiford. “Early Lyme Disease: Solving the Subtle Clinical Clues in an Elderly Patient.” Clinical Geriatrics 15, no. 4 (2007): 20-26. American Lyme Disease Foundation (ALDF). “Lyme Disease.” http://aldf.com/lyme.shtml (accessed November 14, 2014). Centers for Disease Control and Prevention (CDC). “CDC Lyme Disease.” http://www.cdc.gov/lyme (accessed November 14, 2014). National Institute of Neurological Disorders and Stroke (NINDS), National Institutes of Health (NIH). “NINDS Bell's Palsy Information Page.” http://www.ninds.nih.gov/disorders/bells/bells.htm (accessed November 14, 2014). National Institute of Neurological Disorders and Stroke (NINDS), National Institutes of Health (NIH). “NINDS Neurological Complications of Lyme Disease Information Page.” http://www.ninds.nih.gov/disorders/lyme/lyme.htm (accessed November 14, 2014). American Lyme Disease Foundation (ALDF), PO Box 466 Lyme CT 06371, http://aldf.com. Centers for Disease Control and Prevention (CDC), U.S. Department of Health and Human Services (HHS), 1600 Clifton Road Atlanta GA 30329-4027, (800) CDC-INFO (800-232-4636), http://www.cdc.gov. Lyme Disease Network of New Jersey, 43 Winton Road East Brunswick NJ 08816, http://www.lymenet.org. National Institute of Allergy and Infectious Diseases (NIAID), NIAID Office of Communications and Government Relations, 5601 Fishers Lane, MSC 9806 Bethesda MD 20892-9806, (866) 284-4107, http://www.niaid.nih.gov.